This popular take-out stir-fried noodle is so simple to make at home. Cooked with cubed chicken fillet, vegetables and the irresistible “kung pao” sauce and topped with cashews. 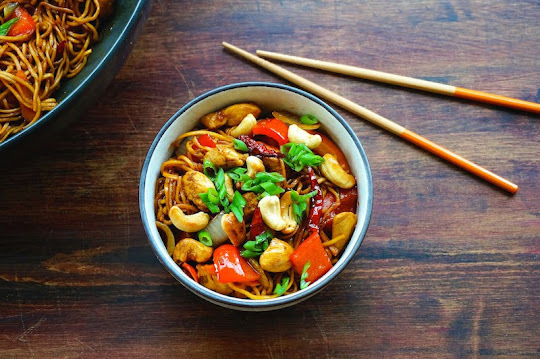 Please check out the video below on "How To Make Kung Pao Noodles With Chicken". Mix together all the sauce ingredients until well combined. Add about 1 ½ Tbsp of oil in a pre-heat wok and sauté the cashews on low heat until golden in color. Remove and set it aside. Then add the remainder 1 Tbsp oil and turn the heat to high. Mix in the ginger, garlic, scallions (white part), and sauté until fragrant. Mix in the dried chilies, Sichuan peppercorn, stir, and add in the chicken. Cook until the chicken no longer pink in color and push it to one side. Hi, where are the amounts for the recipe and the details of what the sauce is? Please check out the video below for the full recipe. Thanks. Thanks for this recipe, I really don't know on how to make that because that recipe was new to me. I hope that I can cook this perfect so that I can taste the real taste of it. I will also share my stir fried chicken recipe and I hope you will also like it.